In 1851 Great Britain was the leader of the industrial revolution and feeling very secure in that ideal. 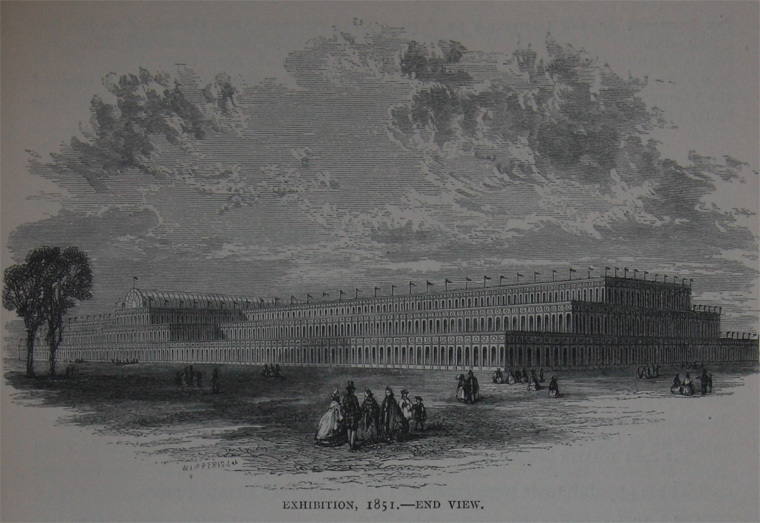 The Great Exhibition of 1851 in London was conceived to symbolize this industrial, military and economic superiority. 1850 The Royal Commission for the Exhibition of 1851 was established by Queen Victoria to organise the 'Exhibition of the Works of Industry of All Nations', the world's first trade fair. Prince Albert, whose brain-child it was, was appointed President. Just representing the feats of Britain itself would have excluded many of the technological achievements pioneered by the British in its many colonies and protectorates, so it was decided to make the exhibit truly international with invitations being extended to almost all of the colonized world. The Great Exhibition was held in Hyde Park in London in the specially constructed Crystal Palace. 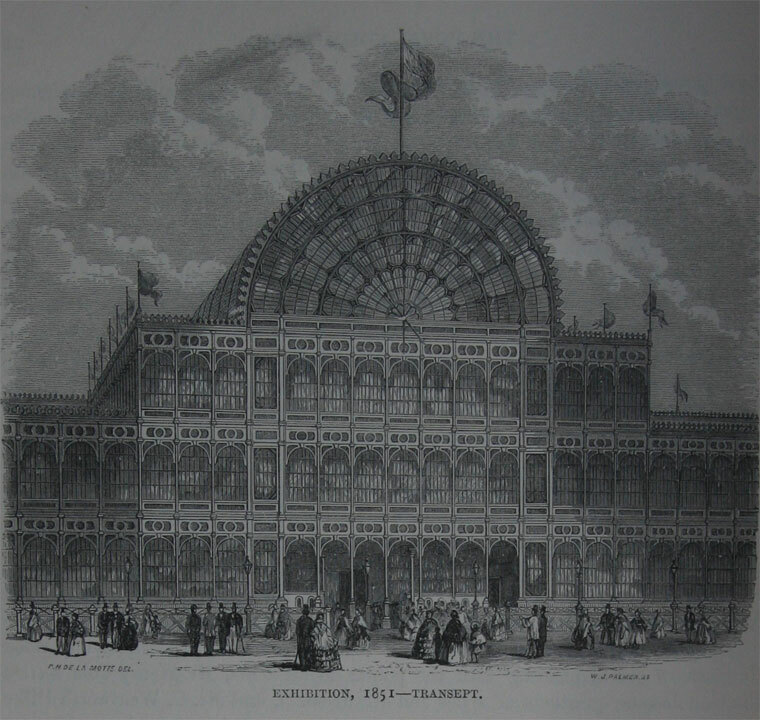 The Crystal Palace was originally designed by Joseph Paxton in only 10 days and was a huge iron structure with over a million feet of glass with the construction overseen by Fox, Henderson and Co. Paxton’s innovative design used modules of glass and iron, that could be fabricated off site and in due course taken apart again, since the building was only temporary. Work began on 1 August 1850. By December 1850 more than 2,000 men were working on the site. By means of ingenious machines invented by Paxton, 80 men could fix over 8,000 panes of sheet glass in a week. Over 1,000 iron columns supported 2,224 trellis girders, 4,000 tons of iron, 30 miles of Paxton’s newly-invented guttering and 202 miles of sash bar. The 16 vast semi-circular ribs of the transept arch, made of laminated timber, took just one week to fix. The flooring was of boards set half an inch apart, so that machines could sweep the dust through the spaces at the end of each day, but in practice the trailing skirts of the women visitors did the job splendidly. There were some 100,000 objects, displayed along more than 10 miles of aisles, by over 15,000 contributors (see the catalogue). Britain, as host, occupied half the display space inside, with exhibits from the home country and the Empire. The largest object was the massive hydraulic press that had lifted the metal tubes of the Britannia Bridge at Bangor. Next in size was a steam-hammer that could with equal accuracy forge the main bearing of a steamship or gently crack an egg. There were adding machines which might put bank clerks out of a job; a "stiletto or defensive umbrella" and a "sportsman’s knife" with eighty blades from Sheffield. One of the upstairs galleries was walled with stained glass through which the sun streamed, almost as brilliantly coloured were the carpets from Axminster and ribbons from Coventry. Among the exhibits from around the world were the Jacquard loom, an envelope machine, tools, kitchen appliances, steel-making displays and a reaping machine from the United States. This building was divided into a series of courts depicting the history of art and architecture from ancient Egypt through the Renaissance, as well as exhibits from industry and the natural world. The famous fountain, standing approximately in the middle of the building, was made of four tons of pink glass, 27 feet high, provided a useful meeting place, as well as cooling the atmosphere. There was a police desk for lost children and umbrellas. No alcohol was sold, but there were various areas where light refreshments were available, provided by Messrs Schweppes. And for the first time ever, "waiting rooms and conveniences" were provided where, by spending just one penny, the visitor could have a private cubicle. There was also an unrivalled collections of statues, many of which were copies of great works from around the world, and a geological display which included a replica lead mine and the first attempts anywhere in the world to portray life-size restorations of extinct animals, including dinosaurs. Crystal Palace Park was also the scene of spectacular Brock's fireworks displays. By the time the Exhibition closed in October 1851, 6 million visitors had seen it, many from other European cities. The Exhibition made a substantial profit, which enabled the foundation of public works such as the Royal Albert Hall, the Science Museum, the Natural History Museum and the Victoria and Albert Museum. After the completion of the Exhibition, the commissioners remained as a permanent body to administer the surplus funds to "increase the means of industrial education and extend the influence of science and art upon productive industry". The capital was carefully managed and annual charitable disbursement of over £1 million are being made to this day. The commissioners proposed to provide a "locality", and establish central institutions working in cooperation with regional interests to promote industrial education for the benefit of the whole country. Within two years the commissioners had bought an estate in South Kensington of 87 acres. The commissioners were assisted by Parliament to complete the purchase of the estate, and elected Government representatives to the commission as ex-officio members to assist them in managing the estate. Government representatives continue to serve, although the partnership with the commission was dissolved in 1858. 1853 the Government founded the Department of Science and Art. 1858 the commissioners assigned to the Government the land east of Exhibition Road in Kensington on which the South Kensington Museum was built. 1860 The Department of Science and Art was moved to land off Exhibition Road; other institutions were established in the same area including the School of Naval Architecture and Marine Engineering (later moved to Greenwich), the Royal College of Science, the Royal School of Mines and the Royal College of Art. From 1860 to 1889 the commissioners used the estate for temporary exhibitions and other activities designed to stimulate public interest in science and art. The commissioners still intended to establish permanent institutions according to their stated aims, and to this end a Museum of Art had been established and Museum of Science was being developed. 1863 part of that site was sold to the Government for the Natural History Museum and other public institutions. The commissioners leased sites for and helped promote the foundation of the Royal Albert Hall, Royal College of Music, Royal College of Art, Royal College of Organists, Royal School of Needlework, National School of Cookery, School of Art Woodcarving and Queen Alexandra's House, a residential hostel for female students. The commissioners also enabled the Government to acquire land for developing the National Science Collections and Library and eventually to build the Science and Geological museums. Land was also leased to the City and Guilds of London Institute for the building of their Central Institution (opened 1884), and for the building of the Imperial Institute (later Commonwealth Institute). The Royal Horticultural Society's gardens occupied a large section of the estate until the 1870s. The remainder of the unoccupied estate was leased to the Imperial College of Science and Technology which in 1907 brought together the colleges already established on the estate, the Royal College of Science, Royal School of Mines and the City and Guild's College. Official, Descriptive and Illustrated catalogue Part II. Classes V. to X. This page was last edited on 18 June 2018, at 08:13.